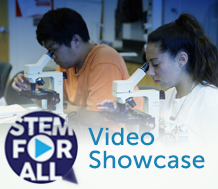 WestEd staff presented several videos this year at the National Science Foundation’s (NSF) STEM for All Video Showcase: Transforming the Educational Landscape. The online event — open to the public — was held May 14–21 and showcased cutting-edge NSF-funded work to improve teaching and learning. Viewers watched video presentations, participated in facilitated discussions of each video, and voted for the videos they believed were most effective in conveying the creative work being done. WestEd created two videos and contributed to the work featured in two additional videos. Check out these and other videos at the showcase, and read the facilitated discussions for specific details about each project. Visit WestEd’s SimScientists to learn more about the project’s suite of innovative STEM research studies. Learn about GLOBE Mission Earth and the Disruptions in Ecosystems instructional unit.